Next up in our Motorcycle Helmet Buying Guide series is Premium motorcycle helmets. In this segment, we cover helmets that range from $250-$500. These helmets typically begin to incorporate some space-age technologies and are built for specific applications. You'll find race helmets, modular helmets, dual sport helmets, and long distance touring helmets. The materials used are of higher quality than Everyday Riding Helmets with the research, development and testing being more extensive. Check out our video guide below and more details about these individual helmets below. This range of helmets is produced by manufactures like Shark, Icon, Shoei & Nolan. Lids in our Premium Motorcycle Helmet Buying Guide will generally meet a higher safety certification (Snell, ECE 2205, etc) than everyday riding helmets. The Nolan N103 N-Com Helmet is first up in this bucket of helmets. It is a premium modular helmet constructed for easy integration with Nolan's N-COM communication system. Standing behind 30 years of helmet-making experience, Nolan Helmets designs and manufactures all of their helmet components in-house in Bergamo, Italy. The chassis of the N103 is an aerodynamic polycarbonate shell with a Lexan faceshield that offers tool-less quick changes. Nolan is known for their modular helmets and they do it as good if not better than everyone out there. The N103 is a round oval head shape which is important to keep in mind. Our dual sport helmet in the group is the Icon Variant helmet, an addition to the Icon lineup in early 2010. More of a street helmet than an off-road helmet, the Icon Variant is aggressively sport styled and offers a great deal of versatility with superior airflow and extra attention spent on design. New for Fall 2010, the Icon Variant Speedmetal is the newest graphic pattern and sure to be a big hit in Icon Fall 2010 Gear lineup. The extra wide eyeport is one of our favorite features of this helmet. It is a long oval head shape and meets All-World Standard, which includes DOT & ECE safety specifications. 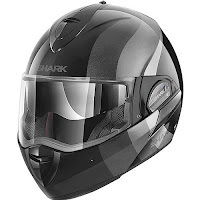 The Shark Evoline Series 2 helmet has been an immensely popular modular helmet in 2010. Shark made some subtle yet significant improvements over the first run of this helmet and the outcome is a helmet that offers great value and versatility. It is the only helmet in our modular selection that can be ridden full-face or open-face without having to remove any parts. The chin bar simply rotates up and around and rests on the back of the head. It has a dropdown sun visor for convenience when riding in the open-face configuration. The Evoline is a round oval head shape and meets DOT & ECE safety standards. 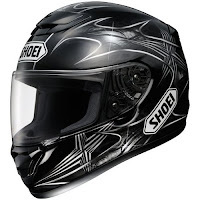 Brand new for 2010, the Shoei RF-1100 Helmet has been a smash hit due to its tremendous upgrades over the RF-1000 and the reasonable price point for Shoei functionality. The RF1100 meets Snell 2010 certification, has an improved ventilation scheme in addition to a spring-loaded shield mechanism that creates a seamless airtight seal at the top gasket. It is built for spirited road riding in a slight tuck as this position optimizes the helmet's ventilation and overall performance. This helmet has a very low profile, sleek design, and is an intermediate oval shape. It meets Snell 2010 & DOT safety requirements. The HJC RPS-10 helmet debuted in the Fall of 2010 after two and a half years of research and development with MotoGP rider Ben Spies, who currently dons this helmet on the circuit. 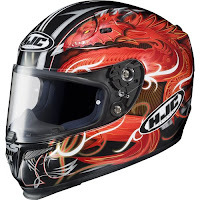 This helmet is the HJC response to the RF-1100; built for an aggressive street-riding (or race) position and offering massive upgrades over the helmet it replaces, the HJC FS-15. Extremely lightweight at only 3.3 pounds with a six-way adjustable ventilation system at the top of the head, the RPS10 is aerodynamic with great ergonomics. The new HJC-20 shield has a one-touch open/close mechanism for tight seal and easy operation. It is Snell 2010 certified and has a round oval shape. 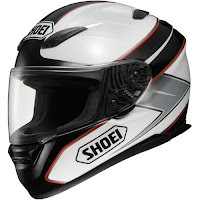 The Shoei Qwest helmet literally just came out within the last week and is built as the long-distance touring version of the RF-1100 to compete with the Arai RX-Q. The ventilation scheme has been moved higher on the head to perform in an upright riding position. 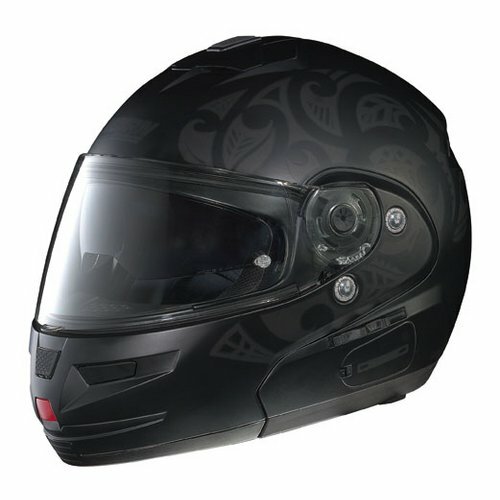 The Qwest has a Snell 2010 certification and utilizes the Shoei AIM+ shell construction. The fit is a slightly rounder oval than the traditional Shoei intermediate oval and accommodates more riders in addition to easy integration of a bluetooth communication system. The balance and weight distribution make it comfortable for long-term rides. The Icon Airframe helmet flows as much if not more air than any helmet in our premium lineup. The laser-drilled air channels are cut at a 45º angle and flow air through the EPS liner for exceptional ventilation. The Airframe is DOT, ECE & Snell 2005 certified and has a dual-density EPS which greatly cuts back on the chance of head injury in the unfortunate event of an accident. As with all Icon Helmets, the Airframe is a long oval shape. For the great amount of air this helmet flows, it is also exceptionally quiet at highway speeds. Also, the Hydradry liner wicks moisture away from your face for added comfort. 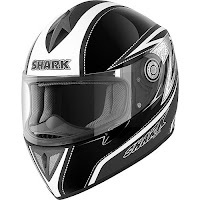 The last helmet in our Premium Motorcycle Helmet Guide is the Shark RSI Helmet. Shark Helmets are known for providing an exceptionally quiet ride. Wind tunnel tested for aerodynamics with a built-in rear spoiler, the RSI is meant to be ridden in an aggressive tucked position. The shell is multidirectional composite fibers reinforced with carbon & aramid with a multi-element internal shock-absorber for safety. The integrated internal ducts direct the airflow for remarkable venturi effect ventilation. The RSI is built for a long oval headform and meets DOT & ECE safety specifications. We hope this detailed guide provides a nice glimpse into the options in Premium Helmet range. Don't miss our Everyday Riding Helmet Guide and stay tuned for our Super Premium Helmet Guide which will be released shortly.